It's ironic that the world's smallest birds have such long bills. Some hummer's bills are longer than their bodies. Hummingbirds' diets are made up of insects as well as nectar from flowers. The length of a hummingbird's bill doesn't interfere with catching protein-rich insects, as the bird'll simply fly toward a bug with his bill open. But the length is useful for reaching deep into blossoms to lap up nectar. More than 350 different species of hummingbirds inhabit the Western Hemisphere, and bill lengths differ among the separate types. The lengths of hummingbird bills vary from as short as 8 millimeters to as long as 119 millimeters -- about 4 1/2 inches. When asked to describe a hummingbird, most people would probably mention his long, needle-straight bill. But just as different types of hummingbirds have different lengths of bills, the bills also have different shapes. While some hummers do have the straight bill that most people think of, other species have bills that curve down. In a research paper on orchids and hummingbirds, Carol Siegel pointed out that a hummingbird whose bill fits perfectly into the nectar chamber of a flower will be able to eat faster and more efficiently, explaining why some hummingbirds have developed curved bills. Hummingbirds have just about as much tongue as they have bill. However, hummingbirds have the "hyoid apparatus" that allows them to stretch their tongues, almost doubling the tongue's normal length. This is helpful when a hummingbird inserts his long bill into an even longer flower. Without the hyoid apparatus, he wouldn't be able to reach into particularly deep nectar chambers with his tongue. The tongue draws the nectar into grooves that hold it in place so the hummingbird can retract his tongue and swallow the sweet treat. Flowers need to pollinate and hummingbirds need the high-energy nectar the that flowers provide. They are the ideal solution to each other's needs. When hummingbirds dip their long bills into the blossom of a flower, pollen clings to the tip of the bird's pointy bill. When he goes to the next blossom for another drink of nectar, some of the pollen gets deposited into the new blossom, fertilizing, while more is drawn fresh from that blossom and carried on to the next flower. 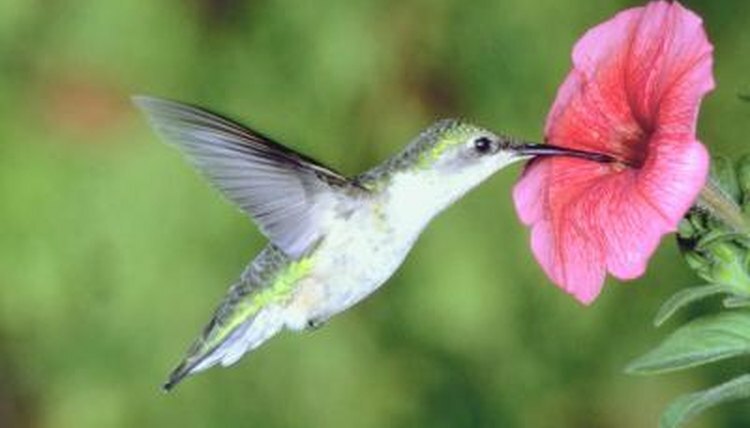 Of course, bees and other insects and even other types of birds act as pollinators for flowers, but hummingbirds play a role, carrying pollen as a favor in exchange for the delicious nectar. Contribuciones Mastozoológicas en Homenaje a Bernardo Villa; Víctor Sánchez-Cordero, Rodrigo A. Medellín, eds.